REDONDO BEACH, Calif. â Sept.12, 2013 â The recent delivery of an electronics unit that precisely positions a highly sophisticated suite of antennas for the U.S. Air Force's fourth Advanced Extremely High Frequency (AEHF) satellite continued Northrop Grumman Corporation's (NYSE:NOC) consistent, on-schedule performance building protected communications payloads for the AEHF fleet. The company delivered payloads for the first three Advanced EHF satellites ahead of schedule in 2007, 2008 and 2009, respectively, to Lockheed Martin Space Systems, Sunnyvale, Calif., the AEHF prime contractor. Integration of the recently delivered gimbal control unit (GCU) begins immediately. Advanced EHF, the next generation of protected military communications satellites, provides vastly improved global, survivable, highly secure, protected communications for strategic command and tactical warfighters operating on ground, sea and air platforms. The system also serves international partners including Canada, the Netherlands and the United Kingdom. "The complexity of this payload provides users with literally millions of options for countering various enemy electronic, cyber and physical threats," said Stuart Linsky, vice president, communication programs for Northrop Grumman Aerospace Systems. "The gimbal control unit on Advanced EHF payloads is one of the most advanced in the industry, operating seamlessly for precision pointing and for optimizing system performance." Each AEHF payload contains 10 mechanically steered antennas as part of a subsystem that processes gimbal-pointing commands for precision pointing. The GCU operates two crosslink antennas, two nulling antennas and six gimbaled dish antennas, all of which have greatly increased pointing accuracy and improved reliability. "The benefit to warfighters is high reliability and high data rate broadband communications in remote regions not covered by fixed RF antenna assets," Linsky said. The AEHF payload provides and controls all EHF uplink, Super High Frequency downlink and crosslink functions, beam forming, on-board nulling, signal processing, and time and frequency control for low, medium and extended data rate operation. 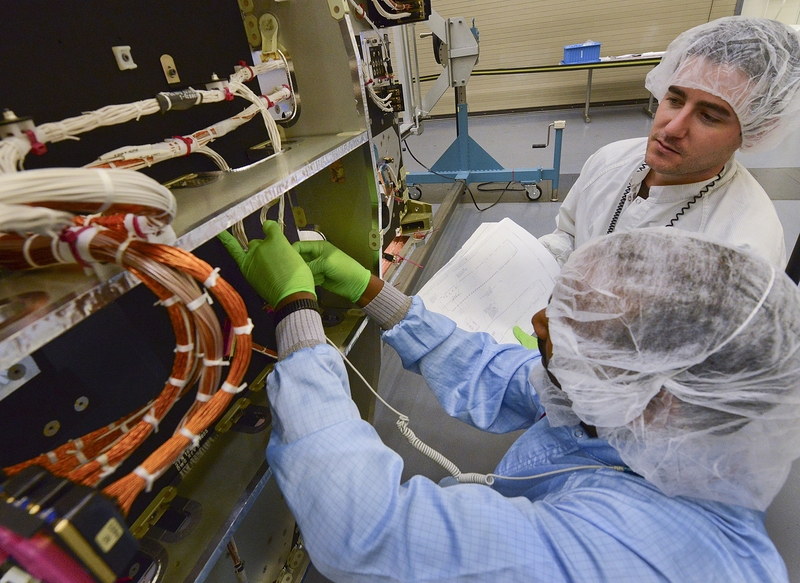 The company has provided sophisticated and robust protected satellite communications payloads with increasing, highly secure connectivity to U.S. military forces for nearly 30 years. As the only company with this capability, Northrop Grumman delivers survivable communications that help achieve information superiority. Northrop Grumman Technicians, Redondo Beach, Calif.